Do you like the look of platinum, palladium, or gold, but can’t afford the premium price tag of precious metals? Dear groom, allow us to introduce you to titanium. This lustrous metal boasts the highest strength-to-weight ratio of any transition metal and is a close contender to tungsten, one of the hardest-known substances in the world. 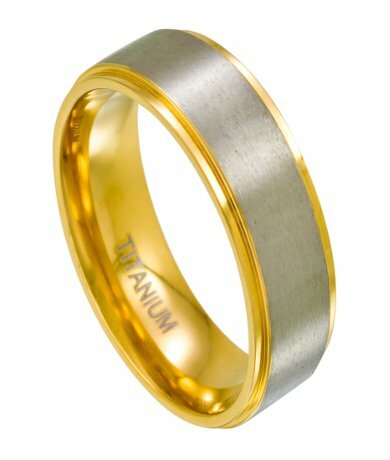 Our titanium wedding ring for men with gold-tone step-down edges is a beautiful example of how striking this metal truly can be. Titanium will not only never lose its shine, but it also offers extreme resistance to denting, discoloring, and scratching over time. Titanium provides a distinctively masculine look that’s only accentuated by gold-tone edges. We offer the 8mm titanium wedding ring for men with gold-tone step-down edges in a wide variety of sizes. Our titanium wedding ring for men with gold-tone step-down edges features a comfort-fit design, which is great news for grooms with large knuckles. Comfort-fit wedding rings can be easily removed for work, working out, or in the event of an emergency. The smooth, satin-finished band encircles this ring in a marvelous way. Two-toned rings are rising in popularity because they can complement virtually any ensemble. Comfort-fit rings tend to measure a half size smaller than traditional wedding bands, so we recommend that you have your ring finger sized by a professional jeweler to ensure that the comfort-fit style is right for you. 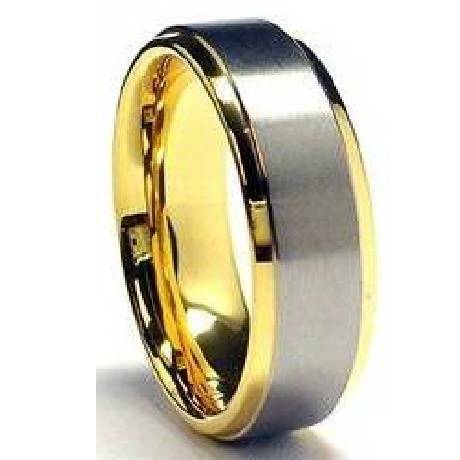 If you have any questions about our 8mm titanium wedding ring for men with gold-tone step-down edges, please contact JustMensRings.com today for more information.